Don't just order and wait - at Nakama, your dinner's expert preparation is also part of the show. Let our chefs show you how to prepare food with flair, right at your table. 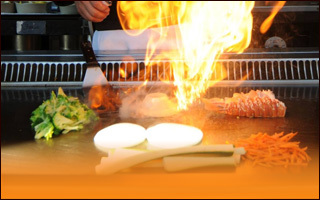 Bring the whole family -- our causually elegant family-friendly hibachi dining is sure to please both adults and kids. Whether it's the knife wielding skill & showmanship of our specially trained hibachi chefs or an exciting sushi choice, our chefs & wait staff have a history of pleasing. Find out what all the fuss is about for a dining experience you'll want to repeat. Come in from 4pm until 5:30pm Monday through Friday & receive 20% off your dine-in Hibachi dinner. You must be seated & order your meal before 5:30pm, so arrive early! A $7 savings on our most popular dinner featuring strip steak, chicken & succulent shrimp. A $7 savings on dinner, featuring our hibachi filet tips & succulent shrimp, seasoned & seared to your liking.